Everton players will be sporting a different logo on the front of their shirts for Thursday’s Europa League play-off round second-leg tie against Hajduk Split in Croatia. Local legislation in Croatia means that the Blues’ Main Partner SportPesa are unable to advertise in the country and the gaming giant thought quickly to gift its usual shirt sponsorship placement to the Club’s official charity, Everton in the Community (EitC), to support in raising the profile and funds for the award-winning charity internationally. 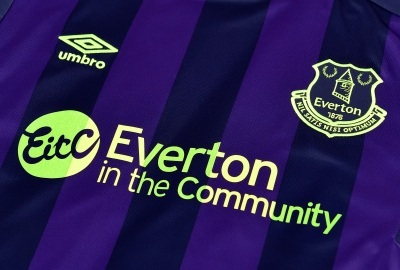 In demonstration of the commitment of football to social responsibility, the UEFA Executive Committee allows clubs participating in UEFA competitions to include the logo of charitable organisation on their playing shirts and gaming giant SportPesa has gifted EitC with the opportunity to take pride of place on the front of Everton’s jersey as Ronald Koeman’s first-team squad look to build on their 2-0 lead over Croatian side Hajduk Split and progress into the group stages of the Europa League. Evertonians will be able to bid for the match worn shirts from the game with all proceeds going direct to EitC to enable the charity to develop and progress its ground-breaking programmes across Liverpool. Professor Denise Barrett-Baxendale MBE, Executive Chair of Everton in the Community, said: "It's fantastic that our exceptional Main Partner, SportPesa, care about all aspects of the Club and its supporters, and we're very grateful to them for choosing to replace their sponsorship with Everton in the Community for the game against Hajduk Split in Croatia. "During our time in Tanzania, this pre-season, we were able to witness and understand some of the community initiatives and investment in grassroots sports being undertaken by SportPesa, an organisation who firmly understand their role in giving back to their community. "Already regarded as one of the best community schemes in the UK, this kind gesture allows us to continue to raise awareness of Everton in the Community across Europe." "The charity has not only made an impact in its own locality, but has also been critically acclaimed for its work internationally. We have already seen the power of Everton’s community work across the recent trip which took the Blues to Tanzania and it is great to be able to give something back to this fantastic initiative so soon. "It is an honour to be able to help such a worthy cause further establish its name on an international platform that will be viewed by millions of people around the world."